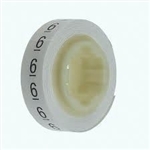 GE 2 Group Marking (White) Marking tags are used for circuit identification and easier troubleshooting. We have many numbers and letters available that will make your designed assembly unique. Horizontal markers for DIN Rail mounted horizontally and vertical for assemblies mounted vertically. Marking tags are used for circuit identification and easier troubleshooting. We have many numbers and letters available that will make your designed assembly unique. Horizontal markers for DIN Rail mounted horizontally and vertical for assemblies mounted vertically. Marking tags are used for circuit identification and easier troubleshooting. We have many numbers and letters available that will make your designed assembly unique. Horizontal markers for DIN Rail mounted horizontally and vertical for assemblies mounted vertically. Marking tags are used for circuit identification and easier troubleshooting. We have many numbers and letters available that will make your designed assembly unique. Horizontal markers for DIN Rail mounted horizontally and vertical for assemblies mounted vertically. Printed wire marker rolls. Printed with number "6". Printed wire marker rolls. Printed with number "8". Printed wire marker rolls. Printed with number "9". Printed wire marker rolls. 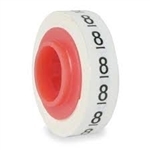 Printed with number "1"
Dispenser filled with 10 rolls of numbered tape (one each of 0-9).